This recipe from Fitness Magazine will have you wondering why you’d bother eating the unhealthy version of this type of salad when you can make this one. This is equally booming with flavor (337 calories/ 13 g fat (3 saturated) per serving= WINNING!) It serves 4 so I usually cut in half and it is plenty for the two of us. Although full disclosure, I don’t half the dressing because I like a little more of it! I hope you’ll enjoy it as much. I recommend Sweet Baby Ray’s BBQ sauce as it my absolute favorite BBQ sauce from the grocery store (Andy Nelson’s BBQ sauce holds the all-time favorite BBQ sauce spot in my heart). It really works with this salad. Have a good week and stay tuned for some treats I made for a recent holiday cookie exchange. They’re easy and your friends/fam will love ’em (and you for making them) this holiday season. Rub each breast with the olive oil, salt and pepper. Grill 3 to 5 minutes per side, or until cooked through, or cut into cubes and saute in a pan (the latter is my preferred method. Let chicken cool. Whisk together the vinegar, mustard and honey. Slowly whisk in the oil. Stir in the basil and season with salt and pepper. Chop the chicken (if you grilled the breasts) and transfer it to a medium bowl. Mix in the barbecue sauce and stir to coat. In a large serving bowl, toss the lettuce, tomatoes, cucumber, zucchini, cheddar, red onions, and dressing. Top with the chicken and serve. No offense Manwich, but my stepdad’s sloppy joes blow your “robust” flavor out of the water. I’ve received stellar feedback on this recipe from many roommates, friends, and Bryan. One of my favorite things about it is how simple it is. It is truly a “add to taste” concoction and you will have a happy tummy every time! Are you ready for the super simple directions? Cook your lean ground meet in a large, nonstick skillet along with your onion or onion powder until no longer pink. 3. 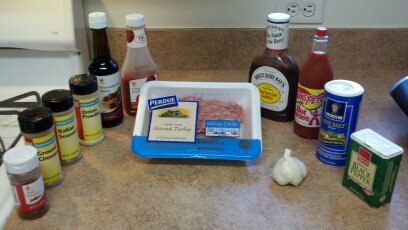 After you have the ground beef or turkey completely coated in BBQ, you want to add about the amount of ketchup you would add onto a large burger as well as a few shakes of Worchestershire sauce and a few shots of hot sauce. Give it a good stir. 4. Now for the spices. 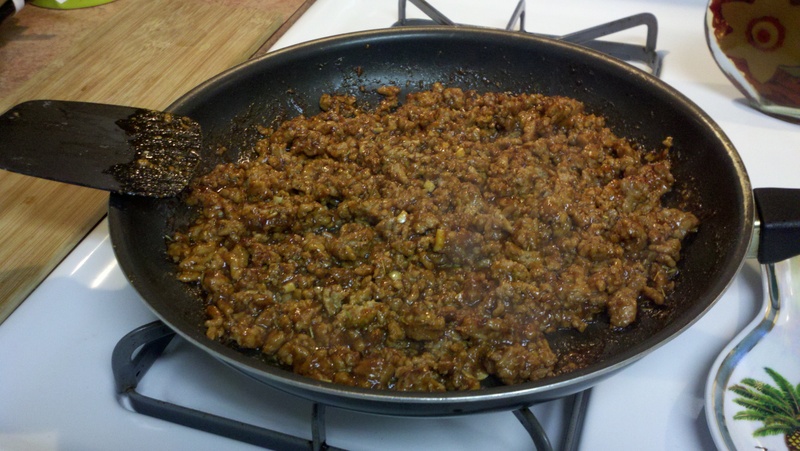 Add your minced garlic, Italian seasoning, salt, pepper, cinnamon, and chile powder. Basically I shake each spice enough to cover the sauced up meat. Add more of what you like as you go. If this is your first time, start with a little of each spice and taste and add more as you go. I love to put the concoction on some sliders and pair with corn of some sort. This was a no fuss night where we did frozen corn and salad. 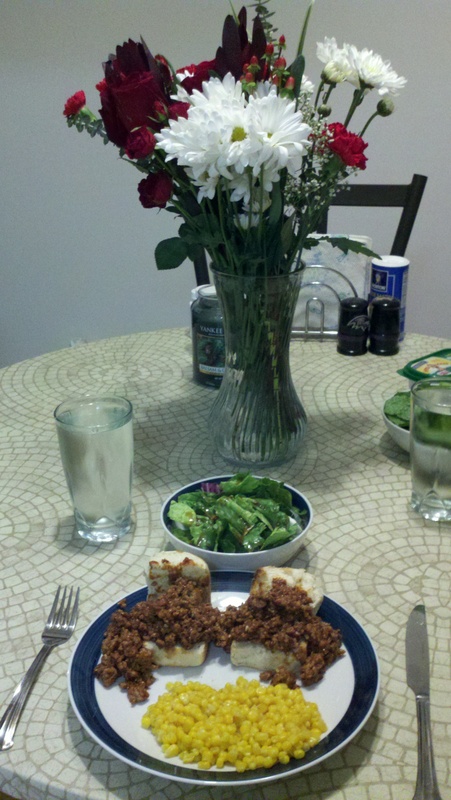 BONUS: Bryan got me lovely flowers that day. Good boyfriend.